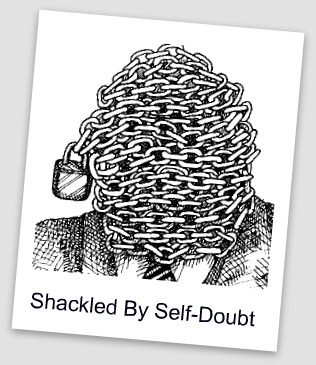 Self-doubt is a debilitating phenomenon. Most of us have experienced some form of self-doubt throughout our lives and the worst time for me was during my formidable years in high school. For those lucky enough to have had a firm belief in who they were during those years, my hat goes off to you. I was not one of those lucky people. I spent many years trying to fly under the radar and just fit in. The image I presented was varied depending on the group of people with whom I was sharing those hallowed hallways. If I were completely honest about my years in secondary school, I would say that the vast majority of those precious moments was spent trying to be something that I didn’t feel I honestly represented. But now, if I really think back, I can’t help but wonder – what if, in reality, I was actually being something that I truly was? Perhaps I doubted myself so much that I was unable to enjoy the different facets of my personality. Each of us has a gift, maybe several if we’re lucky, but each of us also has to realize that sometimes we have to be our own cheerleader, our own geek, our own jock and our own stoner. I finally gave myself permission to be proud of the person I have become. I embrace the many parts of myself and the talents that I have. No longer am I looking for that gratification from anyone other than myself. Those years of self-doubt have since been stored in a box of memories and have been replaced by the belief that my opinion of myself matters the most and I can give myself permission to be every part of who I am. Doubt kills more dreams than failure ever will. I don’t know who coined that phrase but I’d like to buy them a drink! Oh wow, thank you. So nice to hear. In fact, drinks on me all around! This was like my high school experience. So much time and energy was spent trying to fit in and be the person I thought people wanted me to be. As life went on, time and energy became scarce, so I quit trying so hard. Guess what, People came around anyway, and I liked them better than the ones I was trying so hard to impress. 🙂 I guess it just takes time for some of us to grow into ourselves. That is the story of my life since my late 20s. My 30s feel like a total sham. I was always told they were going to be my best decade and that hasn’t been the case and every year I feel like I’m filled with more self-doubt and less and less self-confidence, but somehow I like to think that I keep trying; that I’m making even just small strides to get better. We shall see. I love the quote at the end because it’s so true! When I’ve had the self-confidence to make a move or a change, it’s always seemed to gone well for me but when I don’t, things don’t go well. That right there should give me my answer but it’s easy to see it, it’s another to do it lol. 🙂 I think that I’m working on giving myself permission to be myself also…I just haven’t reached that point yet. Such a great post (as always)!